Description: The user will make replicas of themselves that they can control. This replica will be killed by C tier damage. It will take B tier sensing abilities to see through the illusion. You may pay 20 extra magoi for each clone you wish to create to a max of 5. Description: The user will cause an area of 20 meters to be filled with darkness to the point that nobody will be able to see at all. The only way to see is to use a sensing ability B tier or higher. The user that uses this skill will not be able to see at all either making it a double edge sword kind of deal. Light magic B tier or higher will break this illusion. Description: The user will become invisible and unable to be heard or seen unless a person is using a sensing ability Beta tier or higher. Description: A deck of mystical tarot cards. The user is able to draw powerful illusions from these cards and use them against their enemies. Only three out of the deck are capable of using these powers while the rest act like basic cards. Each card has Marax’s face on the backside to show who’s dungeon they originated from. Description: The user will hold out the hanging man card from the deck causing enemies that glance at the card in the 30 meter area to have chains wrap around them making them become immobile. These chains are just mere illusions that trick the mind into thinking they are bound. Description: The user holds out the card causing a bright purple light to appear. After the light subsides the card will become a tall slender skeleton figure that wields a large crooked scythe. The man is an illusion that has become solid from the amount of power put into him. It will move at a speed of 5 m/s, allowed to fly at same speed, and deal B tier damage with its scythe. The illusion can be broken by being hit with B tier damage. Description: The card will cause a massive ball of fire 10 meters in diameter to be shot from the card in a liner fashion. This ball will go at a speed of 20 m/s up to 30 meters away. While the ball is an illusion it will still deal B tier burn damage to whomever it hits due to it causing the body to believe that the real deal is happening and the skin/ bones/ and muscles to act as if they are being hit by fire. The attack will not damage the ground though do to it not being a living being. 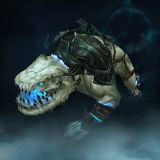 Appearance: A nasty looking creature that spent many moons in the twisted realm of Marax. The beast is roughly 1 meters tall and about .5 meters wide. The skin is a sickly white color and cool to the touch. A blue color radiates from the beast mouth and eyes. Be sure to say its 20 per clone for Gambler's token.